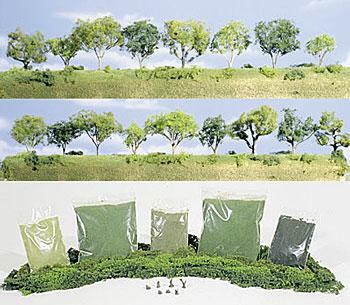 This is the Landscape starter kit by Woodland Scenics. The kit includes a generous assortment of our scenery products - 18 white metal tree armatures, 3 packages of Foliage, 7 tree stumps, 2 packages of Green Blend Blended Turf and 3 packages of Fine Turf accent colors plus fully-illustrated instructions. Retail $59.99 SAVE 24% ! An excellent landscaping starter kit. Realistically molded tree trunks and stumps. Natural colors and realistic texture duplicates nature. Foliage, grass and turf are foam material that's easily applied. This kit is a real value when you compare to purchasing the items separately.